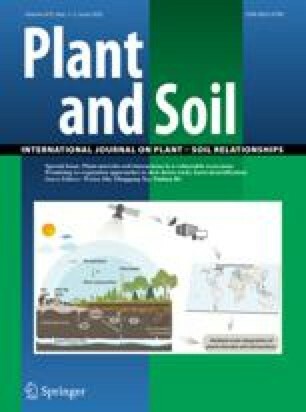 Soil water dynamics under a mixed stand of mature sessile and pedunculate oaks were studied both under natural conditions and during imposed water shortages in a lysimeter. Root densities of each species were described in situ by counting roots in the trench surrounding the dry plot. Soil water contents and potentials, and pre-dawn leaf water potentials (Ψwp) were monitored during three successive years. Soil water retention characteristics were obtained from field measurements of water potential and water content. The decreasing rooting density with depth was strongly related to soil physical properties. The root system was separated into two compartments by a layer with a high clay content. The deepest soil compartment was mainly explored by fine roots. Neutron probe measurements allowed the detection of variations in water content down to a depth of 2.00 m. The distribution of water uptake among the different soil layers changed when drought increased. Water was extracted from the deepest reservoir, and capillary rises even occurred after partial water depletion in the upper part of the soil. Seasonal trends of pre-dawn leaf water potential generally matched those of soil water potential in the wettest rooted zone, which was at − 140 cm. In the upper, dry, horizons, the sharp loss of soil hydraulic conductivity reduced water transport to roots leading to impossible equilibrium between roots and soil at pre-dawn. Finally, Ψwp presented a low sensitivity to variations of total soil water content between 40% and 100% of extractable water. Below this threshold, Ψwp decreased sharply to a minimal value of about − 2.0 MPa.